Knowledge is the basic ingredient of every thoughtful individual who is aware of self-existence, interaction with the surrounding and one’s role and responsibilities, with a sensitivity towards coexistence, in a manner which is reliable and sustainable. Thus, it will help us to bestow upon our beloved descendants an environment where mutual freedom of thought, action and growth perpetuates without infringement upon others. PSR is not driven by philanthropy, rather it is a matter of self-conviction. In philanthropy driving force is affluence and affordability. While, a sense of Personal Social Responsibility (PSR) is a proactive action, driven by a realization that position of every individual is in a pyramid like structure. And each pyramid is a subset of larger pyramid comprising the society. There are which people at levels below the one occupied by the subject and it comprises of those who could not grow a comparable competence, while there are people above him in the pyramid. Every layer below the other in the pyramid bears the burden of all the upper layers. This argument is as much valid structurally and equally it is true in the role of individuals in the social pyramid. 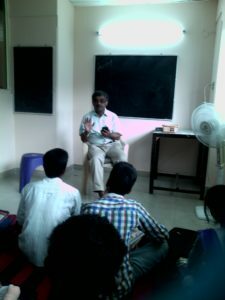 Author was an instrumental in the growth of the model of SUBODH FOUNDATION on the realization of the PSR. The sense of PSR grew stronger as the author interacted with the people operating Corporate Social Responsibility (CSR) and institutions deriving resources under CSR or various tax exemptions available under the law. Author is inclined to questions such donors as to what flaw they find in the model of SUBODH FOUNDATION, is it lack of competence? Or lack of organization? Or lack of passion? Or lack of dedication? If not, is it wrong to groom competence to compete? or, is it wrong to democratize education where every child or adult has equal and open opportunity to receive quality education? Should education be a bounty for children of elite and affluent families? Is not every child born with a right to carve his fortune? Can this right be exercised naturally to test one’s own competence to grow in an environment where cost of learning is absolute and rationalized on the scale of economic affordability? An argument that every individual is born with different inherent capabilities and, therefore, needs different set of environment, training to grow with talent or skill inherent to him. But, who is to decide discrimination of children, at what stage and in what manner? Are there not some basic skill set which every individual needs so as to differentiate between right or wrong, differentiate between human and inhuman, knowledge or ignorance? Education, like nature and human body, has multiple disciplines of knowledge and each is complementary to the other. One may like to acquire a n overview of all the knowledge but the choice of discipline(s) for building expertise is generally governed by inherent capabilities and environmental factors. In exceptional cases by compulsions calling upon survival instinct forces one to acquire necessary skills. In case one is groomed into an environment conducive to the inherent capabilities growth is natural and faster. In this case the role individual is passive since inherent capabilities are governed by biological factors while environment conducive to the growth is provided firstly by the family in which one is born, not by one’s choice or individual’s efforts; it is just a natural process. Secondly, the society in which one has lived. Arousing of survival instinct has a merit that one gets to discover his inherent competence and use it against odds. But, it is a cruel and undemocratic way and the civilized societies proclaiming to be ardent democracies need to examine whether education is democratic. In Indian mythology Vedic era also Krishna was groomed together with Sudama by same Guru Sandipani in a democratic manner. But, will it be correct to proclaim Dronacharya a democratic Guru? Had he been democratic, Karna would not have grown with vengeance and perhaps battle of Mabharata could have been averted. Elite and affluent people if get sensitized to the PSR and choose to pro-act, there would be fewer people among unprivileged class, whose talent surfaces out of survival instinct, and not in natural manner. GOD forbid if they become victim of ill education, the result would more Kans, Ravana, and many more mythological devils, and in recorded history Hitler, Bin-Laden, ....(add more names of tyrant rulers, persons) Killers of Socrates and Judges of Galileo and many more..
What happen to children of elite and affluent families. If one introspects with honesty, Return on Investment (ROI) in terms of quality education is lowest. Unfortunately education is construed in terms of getting a degree to be able to get married to good family, or get a high salaried job and such perspective reflect a commercial instinct far way from objective of education. In truest sense education is the cheapest project which endows highest returns and cannot be compared materialistically. Confucius, the great Chinese philosopher had advised to educate people if really next generation is to be cared. Finally one has to carve his own way, teacher is to create interest, finger holding in toddler stage of learning, and then motivate to discover himself by disobeying law of nature – everybody tries to occupy position of least potential. Every elite and affluent person has surplus resource and time. Real problem in reaching out beyond oneself is not of affordability but of self centric approach. The task of correcting course of education to quality and value based is so large that none can do itt individually, rather it has to e assumed as collective responsibility. If this is realized and pro-acted by elite, it would be possible to avert recurrence Mahabharat, crucification of Christ, Poisoning of Socrates, imprisonment of Galelio and in modern era, inhuman atrocities attacks at US, Delhi, Paris, Pakistan, and many more loosing their bitterness due to frequent recurrence of such evil acts. It is generally seen that elite and affluent people argue that their first priority is profession; it gives them earning to live and support their family. Second is family; it gives them comfort to put in their best at profession. Third is the self, who is at the core of the family. Last comes society and social obligations. But, what is role of society in ones making and being? Can a manufacturer produce if there is no buyer? Would a mother enjoy cooking if family relishes eating outside or is left with no appetite? Would a doctor run a clinic if there are no patients? Each of such affluent needs to introspect who are subjects of his being. Answer would lie in the spirit of a real and passionate teacher who to motivates learning to those who cannot afford it. Quote of Chankya on ‘Failure of Selfless charity’ is debatable. In recent COP21 on Climate Change concluded at Paris on 12th Dec’15 had resolved the conviction of solidarity by developed nation as to the most vulnerable ones. This is the spirit of PSR and has to be assumed proactively by elite and affluent ones towards unprivileged or under-privileged ones. It would radiate fragrance like sandal wood and build harmony and vengeance, mutual respect and not hatred, safety and security but not crime. A society to live with is the ultimate of all, then where is the hitch. Take charge, move ahead, not individually but collectively. There is no competition, think, plan and do what best can be done.